The are many stories on how the Manx arrived on the Isle of Man and how the breed lost its tail. The myths of the Manx go back to Noah's ark, and how the cat was late to board and, while apologising for the delay, promised to pay for her keep. "I will catch mice to pay my way," the Manx told Noah. So he opened the hatch, she came slowly as cats are wont to do, and the hatch came down and cut off her tail. And thus did the bobtail come into being. Thus tailless Puss earned Mona's thanks. And ever after was called a Manx. Tales from the Isle of Man, where the Manx is thought to have originated, have a distinctly Celtic flavour. For instance, cats who are put out at night and find their way in again are thought to have been let in by little people. The king of the Manx is a cat by day, and a little faery king by night - it is said that he travels the lanes in a fiery carriage. Woe to the person who has treated the cat king poorly that day, for when night comes, so too, does the king's vengeance. Another story suggests that Phoenician ships brought the cat from Japan, while another legend describes the cats swimming ashore from a Spanish Armada shipwreck. Given the stories surrounding the Manx, it is no surprise that this cat ranks as one of the oldest breeds. 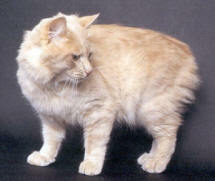 The coat of the Manx exists in a variety of solid, shaded, tabby and particolour colours. Records have been found on the Isle of Man that describe the cat as a mutation of the island's domestic cats, did some of the island cats come off the ships? We will never really know. Since the Manx (or tailless) gene is dominant, kittens that inherit it can have a full tail, a short tail, a rise (known as a "rumpy riser"), or no tail at all ("rumpies"). Breeders have found that it is possible to have all these tail lengths in one litter! The Manx is a very playful cat as a rule. They can jump higher than anyone could imagine, and it is not unusual to find them perching on the highest point in any room. They have extremely powerful hind quarters. It has been stated by one Manx owner that "Manx are the feline sport cars of the cat world with their acceleration and quick turns". Manx exhibit many dog-like characteristics such as retrieving and burying their toys. They will either be known as a "one person cat" or the "family cat". However, once they bond with someone, it is difficult for many Manx to be happy in a different home. On the other hand, there are those Manx that readily accept attention from any human source!